But this is a light hearted look at Christmas in a subtropical climate and what it looks like for us here. I have included some of my photos from last year too. It is popular to string Christmas lights outside to decorate houses and why not when there is no cold weather to contend with? But I have yet to see a live Christmas tree lot anywhere in the city. 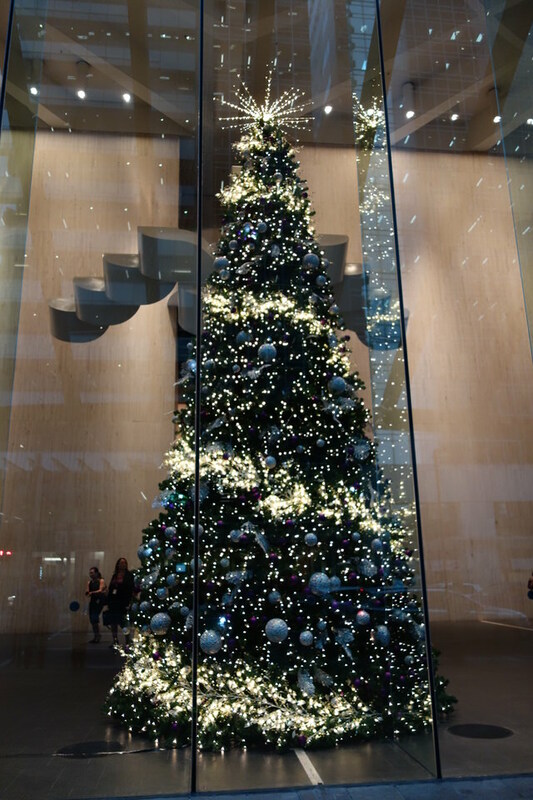 Perhaps they exist elsewhere in Australia, but I am pretty sure that the fake tree is the way to go here. The one above is a pretty example. 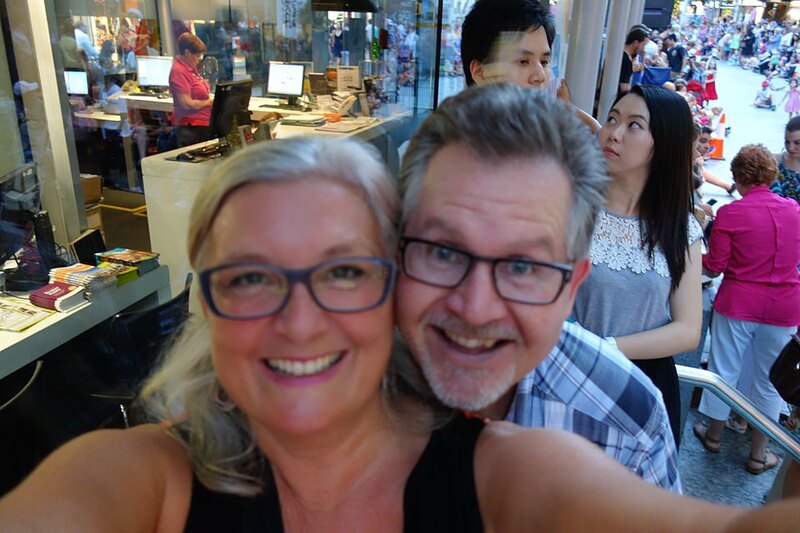 Speaking of lights, the other night Ed and I went into the CBD to enjoy the Myer Christmas Parade and then to watch the light show on City Hall. 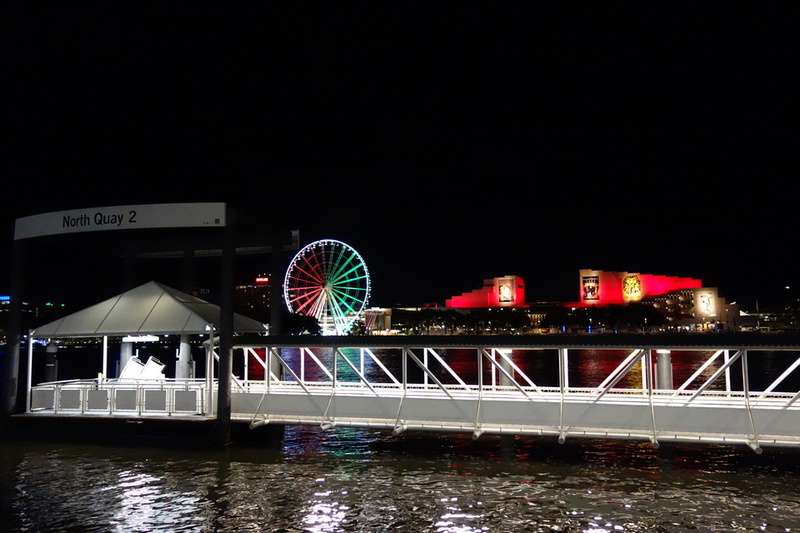 After that we walked down to the river to watch the fireworks display across the river at South Bank. 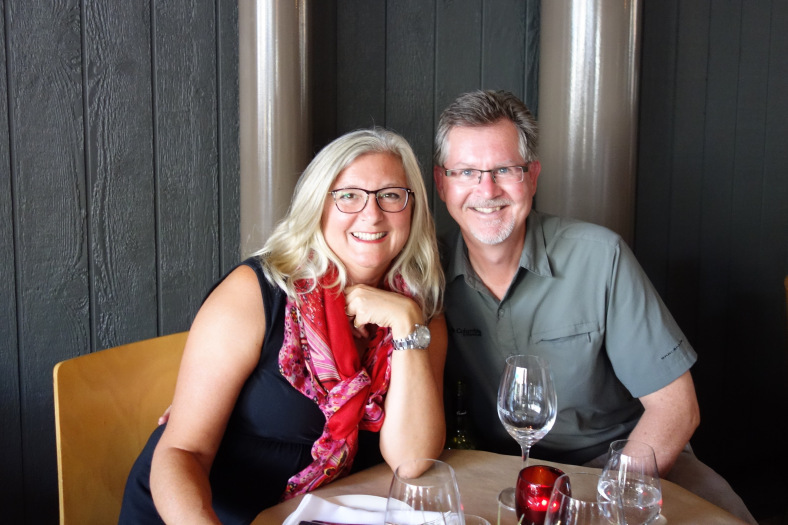 We watched from the ferry terminal at North Quay and then took the ferry home. It was an evening of lights. What was very nice about it is that you don’t have to wear a coat or worry about freezing. In fact, it was quite warm and we were sweating most of the time. By accident I deleted a great close-up of Ed with beads of sweat on his brow. We enjoyed this parade. What was really cool was that they used live animals to enact the Nativity. Wise men were on real camels, the shepherds led real sheep and Mary rode on a real donkey. At the end of the parade, Santa’s sled was pulled by two reindeer! Sadly, neither of them had a glowing red nose. The music portions of the parade were well done, especially the drums. There was even some cowboy style dancing. The Nutcracker pantomime was beautiful, although I didn’t get a very good picture of Clara in her bed. But she had the best job in the parade – she got to sleep and dream while the toy soldiers fought the Mouse King and his army of mice. And now on to City Hall for a really well done light show. First, we watched the “ice and snow” form on the building’s columns and clock. Finally, the “weight” of all the ice and snow caused it all to shatter, thus leaving the building clear for the projection of a Christmas themed story. 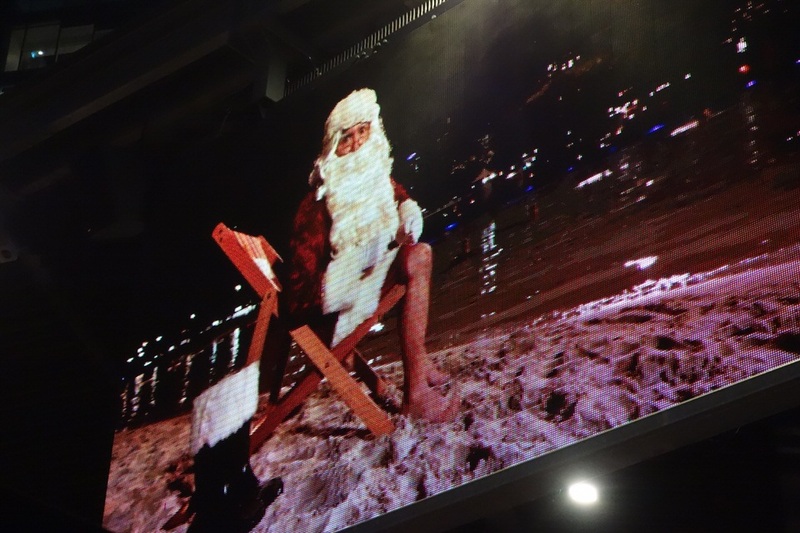 All this included a broadcast from Santa who was cooling his heels at the beach. Australia is obviously to hot for a man in a long beard and furry red suit. 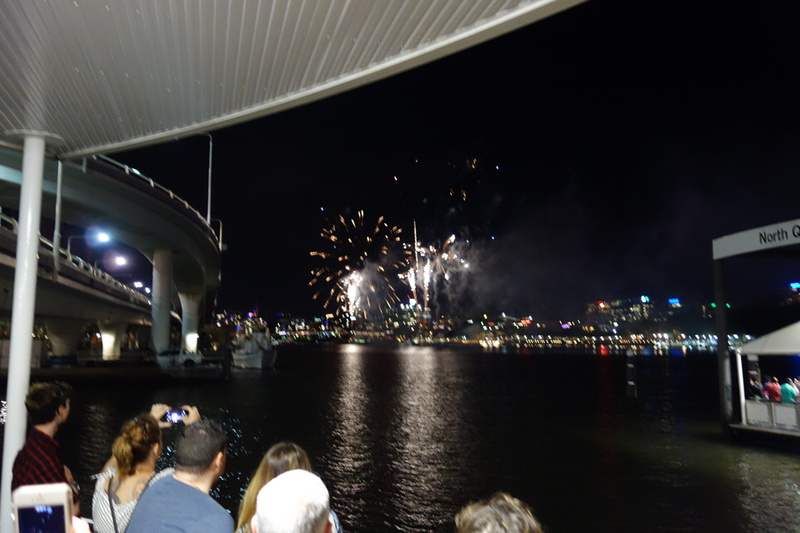 And then, in grande finale style, we went to North Quay to watch the fireworks before taking the ferry home. 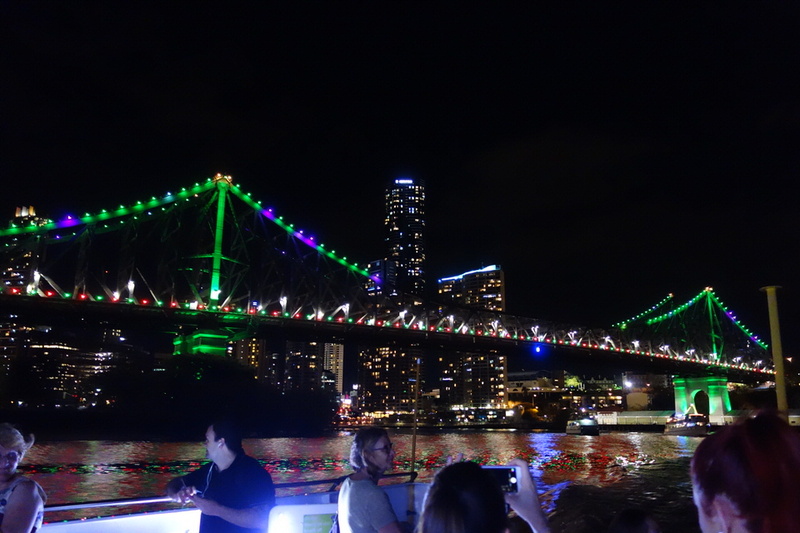 Even the ferry ride was full of lights as we passed under the Story Bridge. 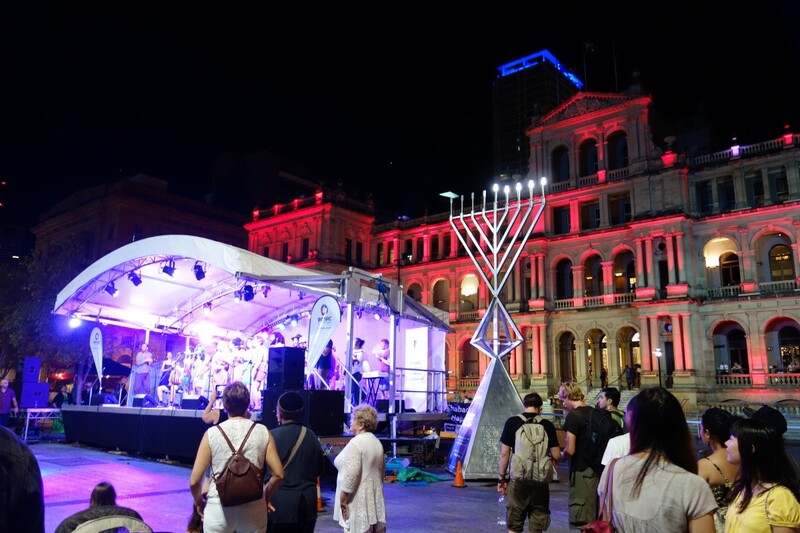 This entry was posted in Our Brisbane Life and tagged Brisbane City Hall Light Spectacular, Christmas, Christmas lights, Christmas tree, Fireworks, Myer Christmas Parade. Bookmark the permalink.